The remarkable Sarah McKinley Austin, who is just 9 years old, portrayed Matilda on opening night...Austin skillfully captures Matilda’s preternaturally calm self-possession, and she brings a beautiful poignancy to the world-silencing ballad "Quiet." "The cast is top-notch as well, led during Wednesday night's performance by the pint-size Sarah McKinley Austin, who brings an edge and toughness - with undertones of tenderness - to the title role. This triple-threat actress can sing - boy can she sing - dance and act, and even has a noticeable sense of comedic timing - at 9 years old." "...it was Sarah McKinley Austin who proved herself a tiny fireball of talent as that title character at Wednesday night’s show. At just age 9, she masterfully plays both tough and sad, and wins over the audience with her gleeful naughtiness, her love of learning and storytelling, and her determined belief in her own worth." On press night, 9-year-old Sarah McKinley Austin, in the role of Matilda, commanded the stage with her tiny body and beautiful singing voice, especially in the song “I’m Here,” a duet with The Escape Artist (Justin Packard)." "At the performance I attended Sarah McKinley Austin smartly captured Matilda’s mix of cool intelligence and conflicted emotions. She held the stage from her opening number – “Naughty” – then proceeded to ground the madness spinning around her, finally leading her peers in a children’s crusade against Miss Trunchbull." "... Sarah McKinley Austin (at the reviewed press performance) is singing, dancing and acting her heart out as Matilda, as are the other eight "maggots" in her classroom at Crunchem Hall." "...at Wednesday's press performance, an adorable and hard-working Sarah McKinley Austin played the part pitch-perfectly." "The title character was played at Wednesday's performance by Sarah McKinley Austin, a little girl who was remarkable in her ability to hold her own on a huge stage but never excessively precocious"
"Kudos to all performers for their work, with a special nod to Matilda of the evening, Sarah McKinely Austin. This tiny 9-year-old commands the State Theatre like she owns it, and there are big things ahead for this talented little actress." "Of special note is of course Sarah McKinley Austin as Matilda. This pint size professional does it all (dancing, singing, acting) with a "beyond her years" embodiment of the character." "Sarah McKinley Austin opened the run Tuesday and seemed utterly at home. Her Matilda never shows self-pity or a craving to be loved." "Austin, who portrayed the young genius on Tuesday's performance, completely embodied the character of Matilda. With her beautiful and strong singing voice, she captured audience's hearts as she sung about her dreams. She was incredibly expressive with her voice and her physicality. When Matilda steps on stage, she gets your attention." "On opening night Tuesday, it was Sarah McKinley Austin as the 5-year-old imaginative girl, and she did an amazing job. When you look at a a cast that is mostly children, and think about what they must accomplish to perform a three-hour Broadway show, it is impressive. Sarah was convincing and charming, and showed vocal and acting skills well beyond her age." "... 9-year-old Sarah McKinley Austin delivers a strong and confident performance proving at such a young age, she is perfectly capable of carrying a show on her back." "It is the portrayal of Matilda herself, however, performed by Sarah McKinley Austin at Tuesday night’s performance, that is most impressive. This little girl is the perfect Matilda, completely understanding the big words she utters and lending an innocence and precociousness to her famed character that is absolutely spot-on and completely charming." "On Wednesday night, tiny 9-year-old Austin took the stage...Austin was heartbreaking in the song Quiet, when Matilda wills all the chaos swirling around her to dissolve." "Matilda was superbly embodied by 9-year-old Sarah McKinley Austin, who got the tiny heroine's precocious intellect, steely will and kind heart just right at Wednesday's show." Sarah McKinley Austin, who portrayed Matilda the night I saw the show, was delightful. She looked and had the right attitude for Matilda. She has a nice singing voice and excellent stage presence." "But it’s the nine-member cast of children who steal this Gothic-like tale, and its secret weapon is Austin as Matilda. Whether she was swirling super glue into her father’s hat or testing out her other growing powers, Austin carried herself as a super self-possessed actor with vocal ability beyond her years." "On opening night, Matilda was inhabited by the delightful Sarah McKinley Austin whose past credits included, no surprise, Young Cosette in Les Miserables. You have to hand it to her: She succeeds in carrying the show on her diminutive shoulders and her clarion voice rings out like a mini-Andrea McArdle in Annie. Yes, she is appealing and all the other necessary characteristics. But back in Row T where you could barely make out her face, she still exuded that strange Dahl sense of optimism and determination in direct spite of hardship. She is no helpless waif." "The role of Matilda is rotating among three young performers, and if they are all as accomplished as pint-sized Sarah McKinley Austin, this national tour is in good, if tiny, hands. Austin sings with authority, has stage presence far beyond her years and is simply adorable." "It takes an extraordinary girl to play an extraordinary girl, and this show has one in Sarah McKinley Austin, a tiny girl with a giant talent." "Austin is a plainspoken, empathetic, adorable Matilda..."
"As portrayed by the charismatic Sarah McKinley Austin Wednesday night the plucky Matilda, a 5-year-old genius despised by her vulgar, self-absorbed parents, is irresistible." But of course, the real show-stealer was Matilda herself (played by Sarah McKinley Austin)! Her deadpan, matter-of-fact remarks had you smiling from ear to ear and reminded me of Sheldon from TVs Big Bang Theory." "But compelling performances are what weave this piece together, right down to Sarah McKinley Austin, playing the Girl’s daughter (surprise!). The role has no lines but the actress has eyes I could read from the 17th row. 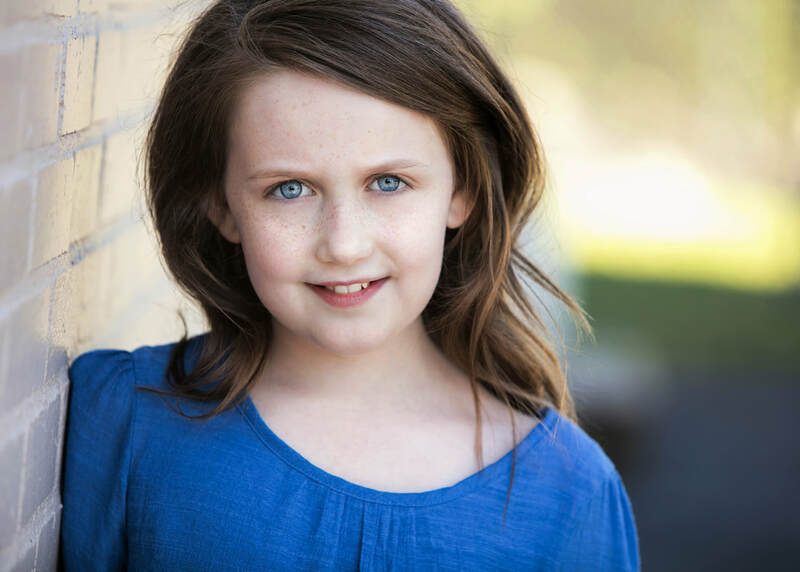 "Little Sarah McKinley Austin displays no affectations as the Girl's daughter, Ivanka..."
"Skillfully directed by John Tiffany...plus a darling little girl named Ivanka, sweetly played by Sarah McKinley Austin"
© 2015-2018 Sarah McKinley Austin - All Rights Reserved.